If like me you're a Lush bathbomb hoarder, then no doubt you will have already checked out their recent limited edition collection release for all things Valentines! Now, i'm a complete single pringle but I can't help not checking out the Lush Valentines collection as I absolutely love the scents of these products as they're all floral and girly, and right up my street! So I thought i'd share my favourite picks from the collection this year, as I know you all love a good old Lush haul! Initially I wasn't going to be picking up any products, as I am on a spending ban but I had a random tenner lying around and I haven't bought any new products this month, and I thought a teeny tiny lush splurge wouldn't hurt anyone! This year they've brought out some absolutely amazing products, as well as a few favourites from the last few years collection and i'm so excited to try the products I picked up! From what i'd seen on social, I knew that I wanted to get my hands on the Rose Bombshell Bath Bomb (£4.25) as a Lush account that I follow on Instagram popped a demo video of this up on their story and after seeing how amazing this looked in the water I couldn't not get my hands on this. It smells absolutely incredible, as all of the ingredients are rose based and as it fizzes it releases rose petals, which sounded just bloody incredible and I cannot wait to have myself a little rose scented Lush bath with this! Another bath bomb that I wanted to get myself was the Cupid Bath Bomb (£2.95) as it looked absolutely adorable, and I always like to try out the newer products as you never know if they will come back next year. Again this smells absolutely incredible and all things floral but it has a lovely hint of bergamot which sounds so uplifting and so me! The last product I picked up from the newer products, mainly because I am a total emoji queen is the Lovestruck Bubblebar (£4.25) which gives all of the heart eyed emoji vibes! Now I thought this was a bathbomb, and only when i've come to type up this post have I realised that it is in fact a bubblebar, and I have far too many in my stash but I still absolutely love this! I also loved this for it's citrusy scent, as I am also a huge fan of citrus scented products and again I can't wait to use this! Now the last product photographed I didn't actually buy, as I already had one in my stash but this year they've brought back the Unicorn Horn Bubblebar (£4.25) which i'm sure i'm not the only one who is happy about this! I asbolutely love this bubblebar, and this year they seemed to have improved it once again and have taken out the little stars that seemed to fall out of them before you even had chance to use them! So those are the few bits I treated myself to from the new Lush collection, and i'd definitely recommend popping into your local store to check out the collection as you won't be disappointed! 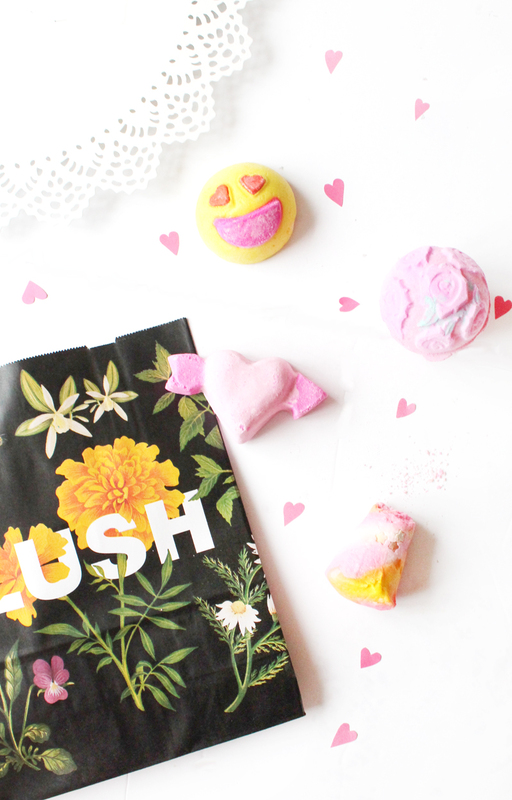 Have you picked up anything from the Lush Valentines collection?